Need higher throughput? Take a look at COM-SPEAR1340 system-on-module with dual core Cortex-A9. 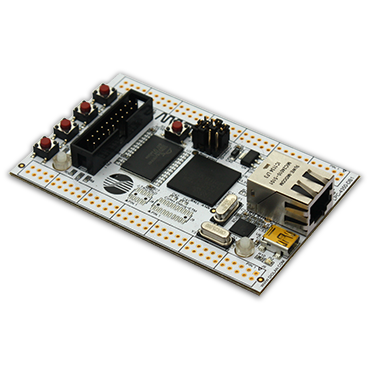 In addition to all the LPC4350-DB1 demoboard components LPC4350-DB1-A evaluation board contains assembled connectors and plastic legs. You can use the side connectors to connect wide range of compatible extension boards (see below). 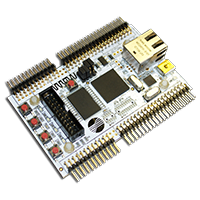 The LPC4350-DB1-A modification of development board suites for software engineers, who need to evaluate the extended functionality of LPC4350-FET256 dual-core (Cortex-M4 + Cortex-M0) micro-controller, but don't want to bother with soldering.